Most men transferred here from Yokkaichi according to the report of Lt Col Guy H. Stubbs, Inf, Luzon Hq. Pvt. 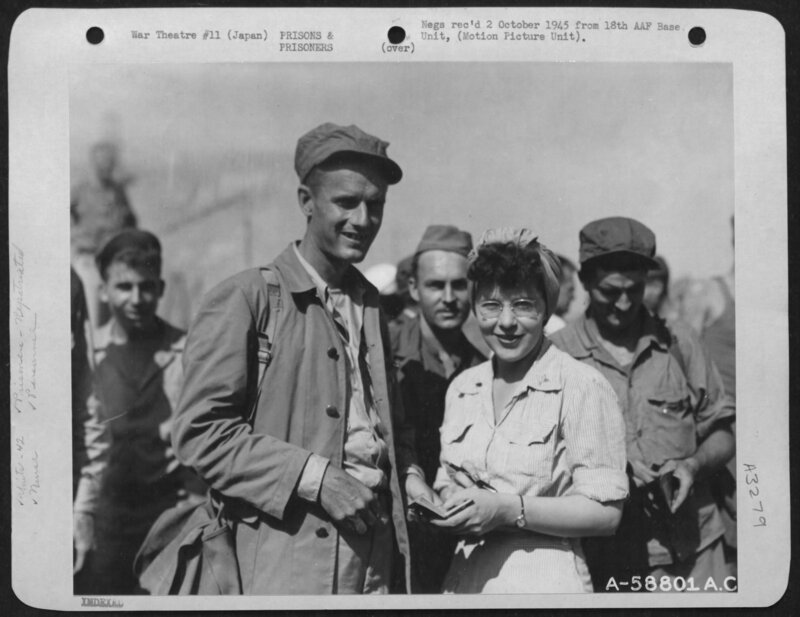 Orman Jacques and evac nurse - "American Army nurse, Lt. Eleanor Pope, from Girard, Ohio, of the 42nd General Hospital, greets an American prisoner of war, Cpl. Orman Jacques, from Glendale, Calif., who was imprisoned at Toyama Camp #7. Dock area, Yokohama, Japan. September 1945." "My father, C.L. Wood was the CL Woods you have listed as one of the Warrant Officers at Nagoya Camp #7-B. He was with Col. Stubbs throughout most of the war. He was a veteran of six camps. As a Warrant Officer, he was in charge of a portion of the men at this camp. Also the Japanese allowed him to keep a small notebook to help keep track of who was in his charge and take some notes. It consists of about 70 pages, listing names of the men he was responsible for, their number, some details about their duties, and a few misc notes. He mentioned the death, time and date of C.S. Uckerman. I also have copies of two debriefings in which he mentions the American bombing of Toyama. "I'm also sending a copy of a debriefing done in 1947 and a three-page statement I got that I think was done shortly after he got back. I'll include a pic of an arm band, and wood tag written in Japanese [which say "Leader"]. Also a letter my father received from Yoshiaki Komatsu of Nippon Soda Company. Not sure of his position there. I assume they knew each other from Nagoya 7B. "Maj Mike Dobervich was one of, I think six POW's that escaped from, again, I think Davao. He and my father were friends. My father probably would have gone out with them, but was flat on his back with beriberi, amoebic dysentery, and malaria. Barely survived. Maj Dobervich came to see my father the night before they went out and gave him his dog tags, which my father carried for the rest of the war and returned them to Dobervich after the war. I have the official Marine photo of him returning them." 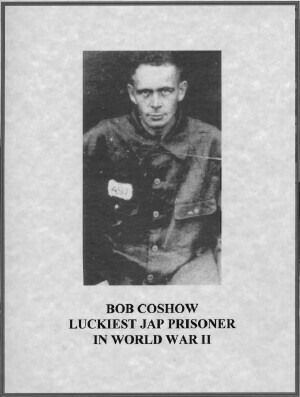 Rescue Roster: NARA Archives File No 3151-4- Recovery Team #53 - Americans only at this camp; 150 known to have come over from Nagoya 5B Yokkaichi POW camp that manufactured sulphuric acid. Post-war investigation of camp by 1st Lt. Joseph G. Breaune and 1st Lt Richard H. Wills Jr. for the SCAP Legal Division. Investigation of signed affidavit (appeal for clemency) for Camp Commander Shoichi NEGISHI by Lt. Col Stubbs; cites Negishi's care of POWS. Charles T. Bruce diary notes (original document, PDF) from Davao to Nagoya, including hellship journey, camp instructions and POW orders. Caution: In the compilation by Wes Injerd, the men from Yokkaichi (formerly Osaka 17] were sent to Nagoya #5B. There were 4-5 camps all known by the POWS simply as "Toyama". Lt. Col Stubbs clearly identifies this as being Camp No. 7 and he is listed on the camp rescue roster "Toyama." It is his list that identifes the deceased at Yokkaichi.